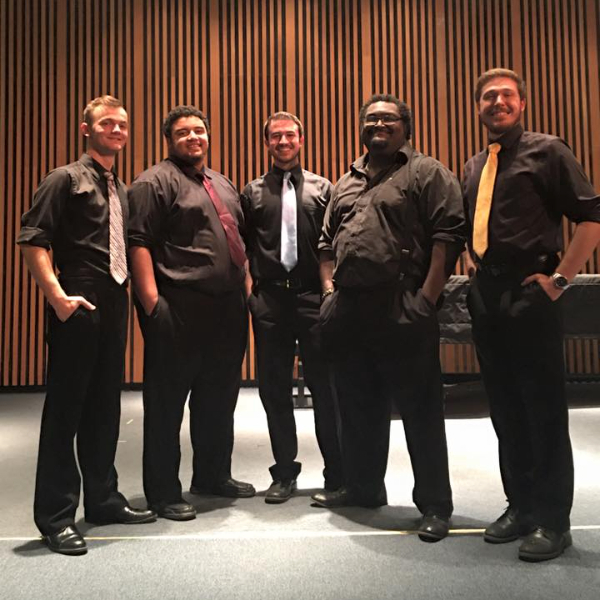 The Zeta Chapter of Phi Mu Alpha Sinfonia has enjoyed a long and rich history at the University of Missouri-Columbia and from its beginning, has continued to bring music to and serve Mizzou with pride. The University of Missouri, Zeta’s Alma Mater, was founded in 1839 as the first public university west of the Mississippi; its 1,262 acre campus is not only designated as an official botanic garden, but also is home to 33,000 students, 18 inner colleges and schools, and 20 NCAA Division I sports teams. The University of Missouri is also one of only 60 institutions to be offered membership to the Association of American Universities. This number of members stays fairly constant up until the mid fifties, with 15 members in 1909, to 19 members in 1954. Following declined numbers past 1964; Zeta began initiating much larger numbers of brothers, receiving awards for being in the top five or twenty chapters in terms of recruitment. By 2001, Zeta brothers numbered in the mid thirties, however there is little information regarding size of the chapter in the years following. As of today, Zeta proudly possesses a strong body of 49 members. Since its founding date, Zeta has initiated over 1050 Sinfonians. Zeta Chapter also has past members of various merit, including former Supreme President Chester R. Murry, former National President James T. Quarle (former Faculty Advisor and founding dean of the School of Fine Arts), and Honorary Sinfonians Rudoplh Ganz and movie star and baritone Nelson Eddy. Being a force on campus since the early days of the School of Music, or “Department of Fine Arts” as it was known at the time, Zeta Chapter founded a Phi Mu Alpha Series of concerts in 1907 which were to be presented annually to the public. Zeta proudly sponsored this series until 1924, where it began a seven year transition in management to the University. This concert series still exists to this day, fully sponsored by the University of Missouri. The University Concert Series brings musical, dramatic, and dance acts from around the globe, as well as School of Music ensembles and Department of Theatre productions, for the enjoyment of Mizzou students and the city of Columbia. The Series boasts past performances of Pablo Casals, Vladmir Horowitz, Percy Grainger, Itzhak Perlman, The St. Louis Symphony Orchestra, Willie Nelson, Smokey Robinson and many more. Presently, Zeta Chapter advances the School of Music and the art itself by presenting two concerts of American music per year: one in the fall featuring Sinfonian performers and the other in the spring to present the works highlighted in the American Music History course of Dr. Michael J. Budds’, a newly initiated Honorary Sinfonian. Each fall the chapter works with Marching Mizzou to provide over one hundred man-hours of community service for the “Champion of Champions” high school marching band competition. Additionally, members work to usher as many concerts sponsored by the University as needed, taking recital attendance and handing out programs. In the spring of 2016, we brought our efforts outside of the Mizzou community. 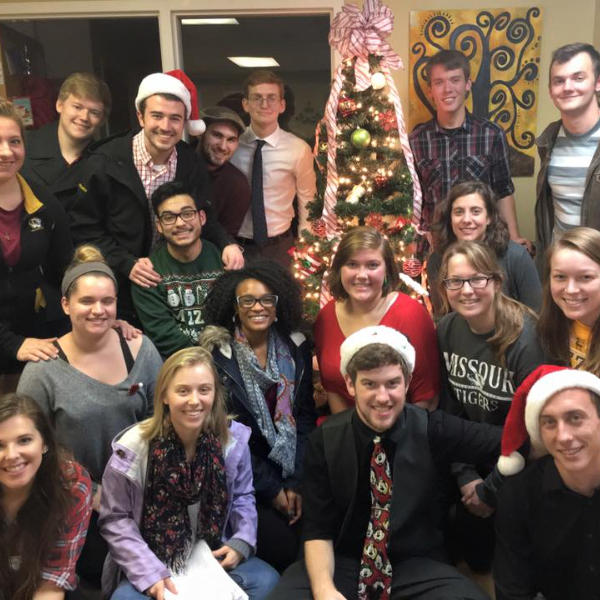 Members of Zeta Chapter traveled with sisters of Sigma Alpha Iota- Iota Lambda chapter to St. Louis to bring music and musical activities to over fourteen various after school programs such as ASAP and KEEN, as well as playing and singing in the St. Louis Children’s Hospital. 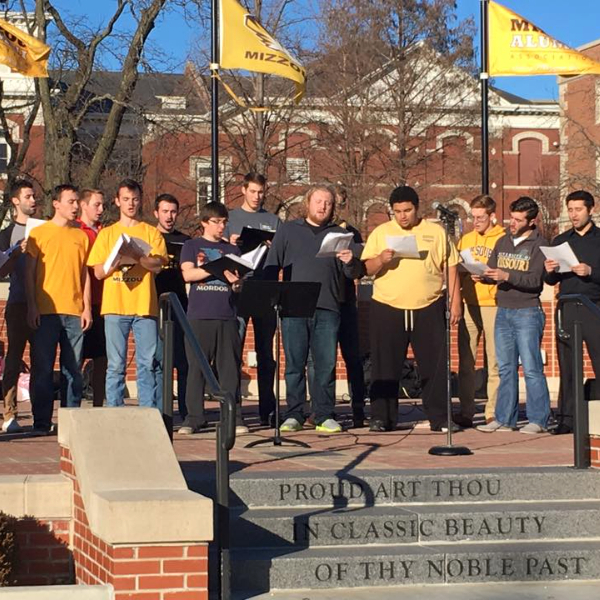 The chapter also takes value in the betterment and quality of campus environment at the University of Missouri, responding to the protests of racial injustice and tension on campus in the fall of 2015 by holding a “Healing Concert” on Carnahan Quadrangle. We also paired with Sigma Alpha Iota, Kappa Kappa Psi, and Tau Beta Sigma, representing the Greek Music Organizations at Mizzou, to deliver statements regarding further racial issues on campus in the fall of 2016. Additionally, the chapter possesses a ZIDI (Zeta Initiative for Diversity and Inclusion) committee which addresses issues of diversity within our Fraternity and at Mizzou.